Whenever you run an analysis, produce a graph, or do anything that generates output (even loading a file), the SPSS Statistics Viewer window pops up automatically to display what you’ve created. This display is the most fundamental form of output from SPSS and is the first step in producing other forms of output. You can output data from SPSS Statistics Viewer in several file formats appropriate for use by other applications. Some output formats are graphics only, some are text only, and others are a mixture of text and graphics. Some form of graphic output is usually necessary because of the graphs and charts constructed by SPSS. 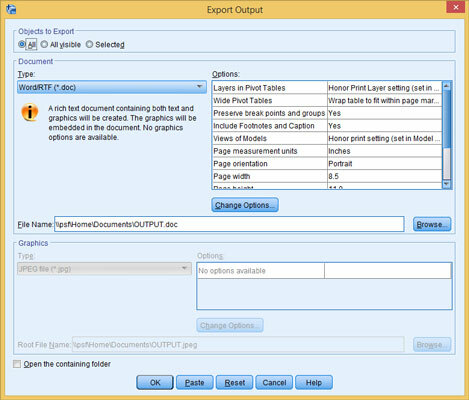 In every case, you begin by choosing File→Export from the menu of SPSS Statistics Viewer, which displays the Export Output dialog box. In the Export drop-down list, you can choose which items in the View window to export — the entire document, the text of the document without graphics, or the graphics without text. The main control window for generating output from SPSS Statistics Viewer. The set of selections made available to you in the Export Output dialog box is determined by the types of objects being displayed by SPSS Statistics Viewer, which (if any) are selected, and the choice in the Export drop-down list. The only combinations of options available are those that produce output. 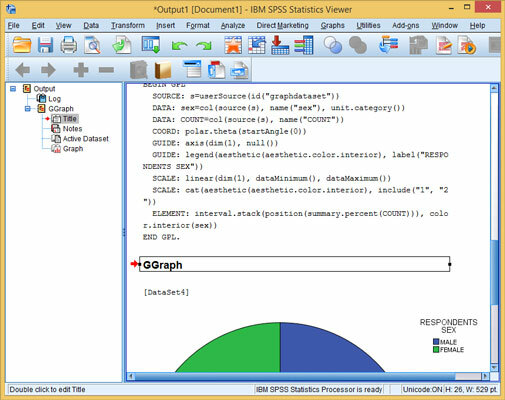 The following figure shows an SPSS Statistics Viewer window displaying both text and graphics. On the left is a list of names of objects. If the name of an object is visible in the list, the object itself is visible in the SPSS Statistics Viewer window. You can make objects appear and disappear by clicking the plus and minus signs. The SPSS Statistics Viewer window displaying text and graphics with some objects selected. If the name of an object is highlighted in the list, the object is marked as selected in the SPSS Statistics Viewer window; a selected object appears surrounded by boxes. (In the figure, the log, title, and notes at the top are not selected, but the other objects are.) When producing output, you can select to export only visible objects, only selected objects, or all objects.